A tanker smashed into the bridge linking Kansai International Airport with the mainland on Tuesday, leaving 50 foreigners stranded at the Kansai Airport HUB. 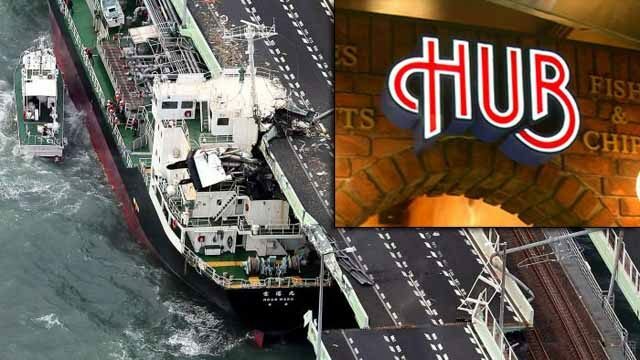 “They couldn’t leave because there was nowhere else to go that sold beer,” said local police spokesperson Yuji Hirotaka. A general lack of freedom caused a Lord of the Flies type scenario. “Without freedom Westerners simply lose their minds,” said Hirotaka. Hirotaka said the foreigners started turning cannibalistic and reported a lot of gaijin-on-gaijin nanpa activity. At press time, no male gaijin had successfully picked up a foreign woman.